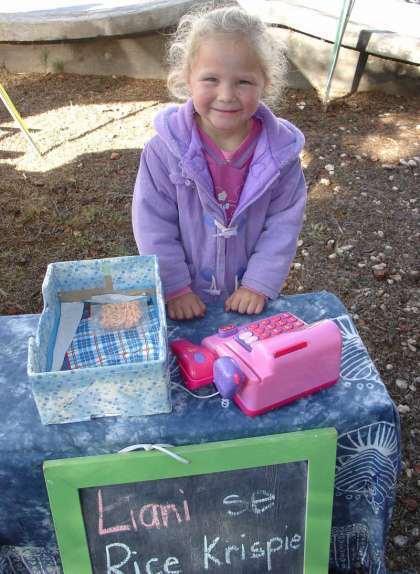 Meet Liani Beetge, the newest and youngest trader at the Saturday Village Market. Not only is she utterly adorable, she is also quite a dynamic young sales lady! Liani is just 4 years old and has been accompanying her family to the market where they have a food stall for some time now. It didn't take Liani long to show an interest in what they do (they are the well known "Pikkiwyntjie" caterers and Spit Braaiers) and decided to follow suit with her own stall. So popular is her speciality cookies - 'Rice Crispie Cookies' - that by the time I got there to interview the little entrepreneur, her stock was depleted, bar one cookie! "I help my mom make them each week", she said. "My job is to stir the marshmallows, butter and Rice Crispies". "How much do you sell your cookies for", I asked. "R2 each", she said. And (testing her maths skills), "How much for TWO cookies?" .... "hhmmm... R2 also!" The maths skills will come. In the meantime, she has her own 'till and scanner' ... please don't forget when you buy her cookies... it must first be SCANNED before you leave the stall! We wish you success with your stall Liani - you're doing a great job! Even if your cookies were not good (which they are! ), that winning smile bowls us over completely and is enough for everyone to want to support you!